Walking, biking, and climbing stairs strengthen muscles in your lower body. A recumbent bike or stair stepper is a safe way to start if your balance needs a lot of work. Stretching loosens tight muscles, which can affect posture and balance. Yoga strengthens and stretches tight muscles while challenging your static and dynamic balance skills. Tai chi moves, which involve gradual shifts of weight from one foot to another combined with rotating the trunk and extending the limbs, offer a series of challenges to improve your balance. What if you're not at all active? 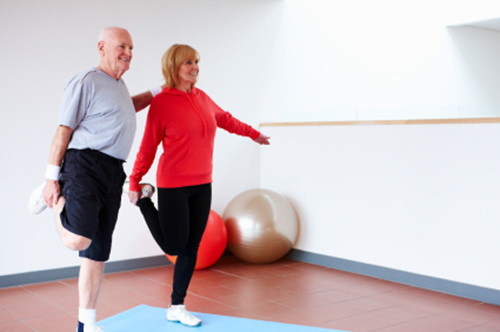 Research shows that the right exercises can help sedentary folks dramatically improve their strength and balance at any age or ability level. For workouts proven to help hone your balance, buy Better Balance, a Special Health Report from Harvard Medical School.